I wouldn’t look good in it, but really, who cares? It’s gorgeous. 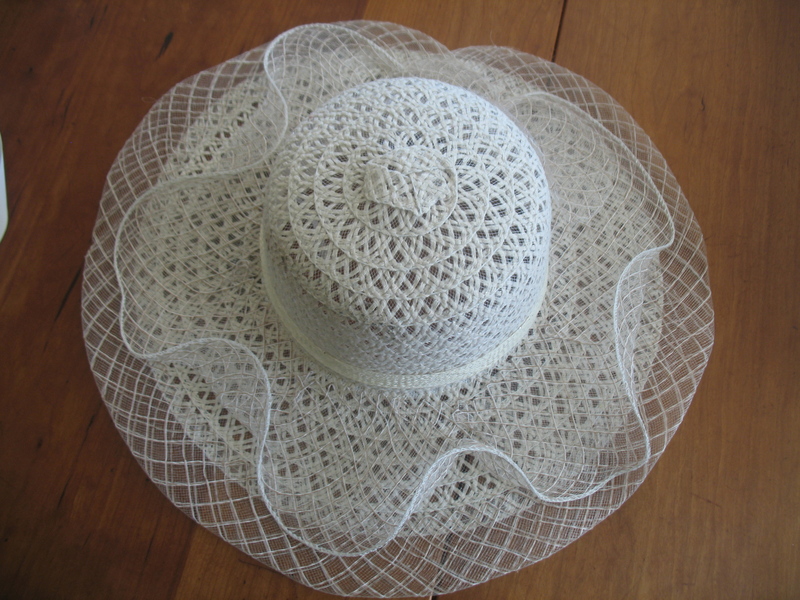 Note the ribbon ties that make it a bonnet. 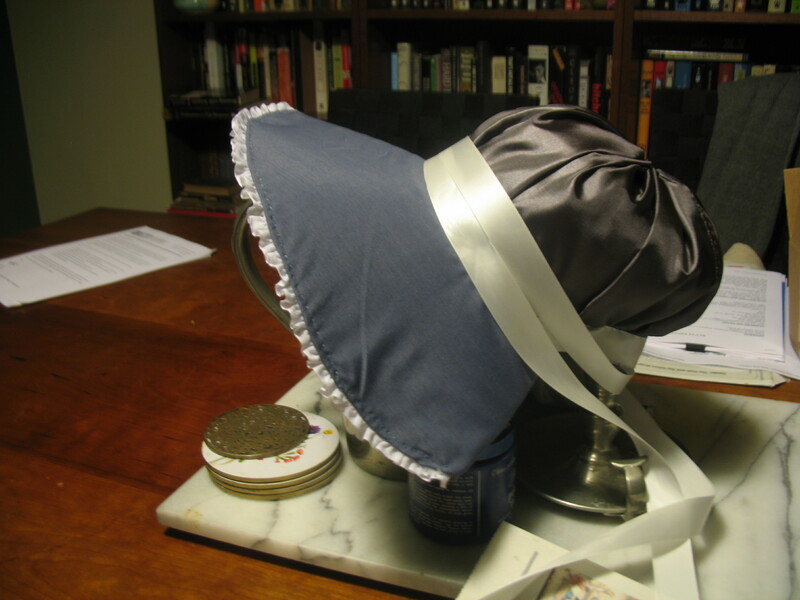 Anyway: this week I made a bonnet. Yup. As with all my recent excursions into Regency clothing, I suspect the next time I do this I will do a better job. But it’s a start. 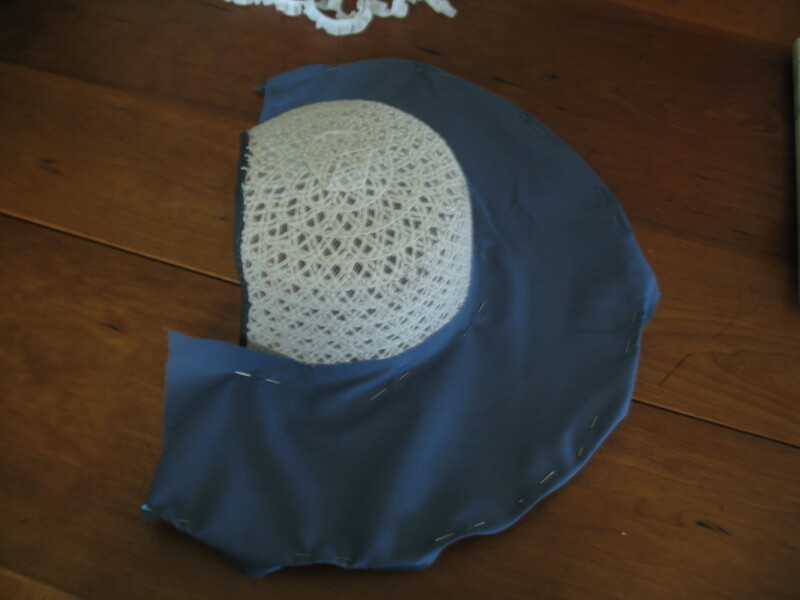 This, if I say so myself, was a big pain in the neck, but once the brim was covered and pinned into place, I started to line the bonnet, again because TWUH’s interior is no lovelier than its exterior. 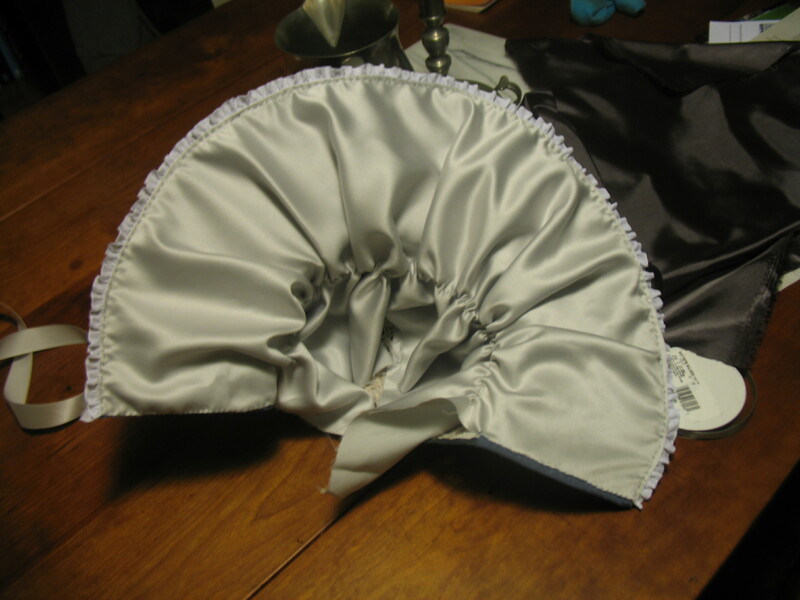 So I sewed a ruffle onto a piece of light-weight gray “satin” and started pinning that to the underside. 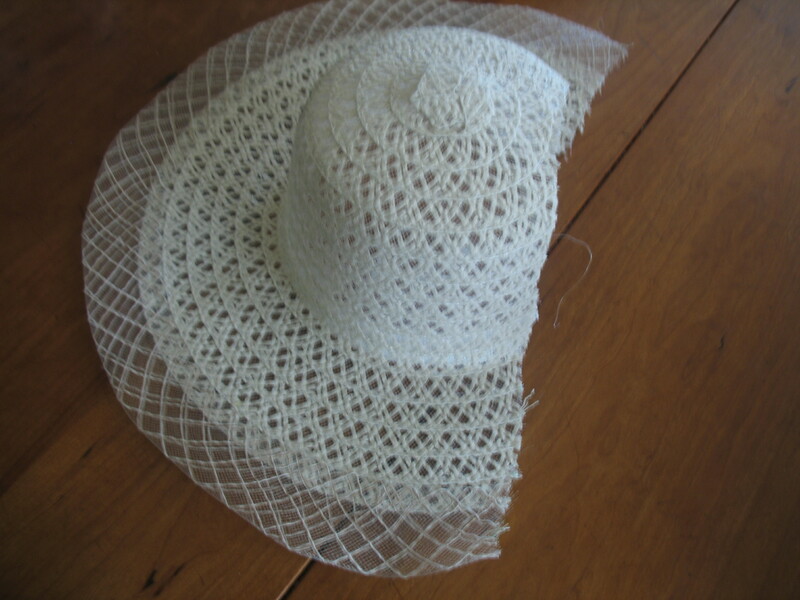 My thinking here was that once pinned, a single set of stitches would attach both the brim covering and the lining, and Lo, it worked. I love it when it works. 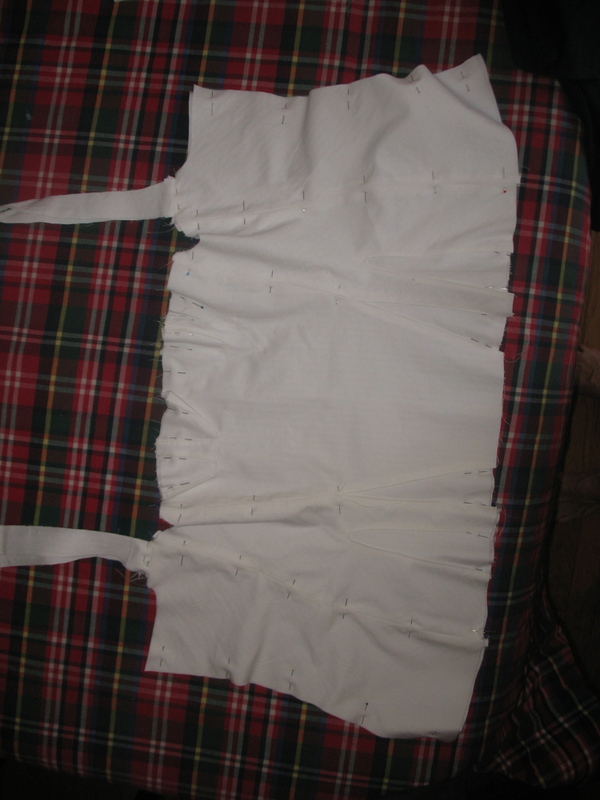 Here is the finished, gathered lining. It might have worked better with more fabric or a lighter fabric; next time I’ll know. Stitching the crown in place was probably the most difficult sewing of the night, because I had to make sure I caught all the fabric, and the plastic of TWUH was thick and annoying to work with. 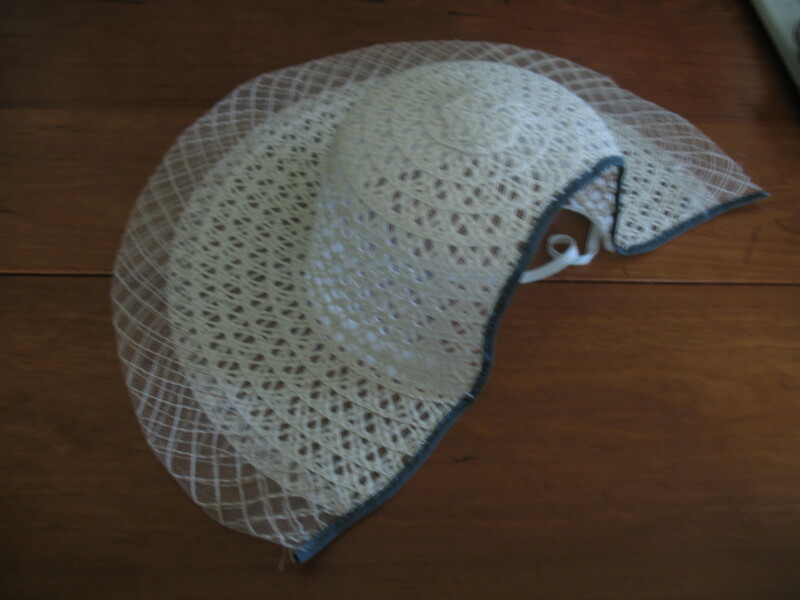 I also basted down the upper edge of the brim cover (which caught the lower-edge of the lining inside. I like it when work does double duty). . The ribbon is pinned in place to hide the unsightly join. Next time I will not be in such a hurry, and I will get the proper materials. I might even get a real pattern. When I am seized by inspiration it’s really hard not to just dive right in. Speaking of which, I really should get back to actually writing stuff…. I have made my Regency gown to go with the Regency coat. 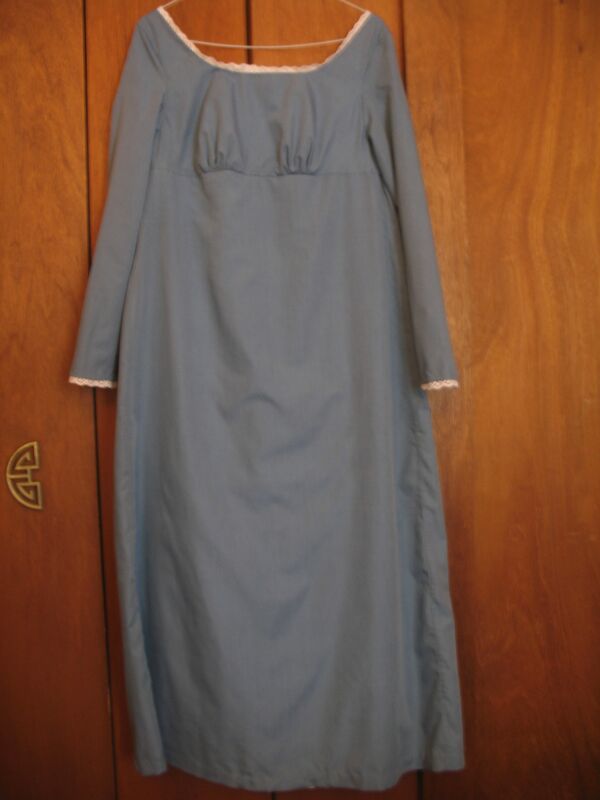 It’s a plain blue cotton “round gown” (which term means the gown buttons in the back) with a touch of lace at the neck and wrists. 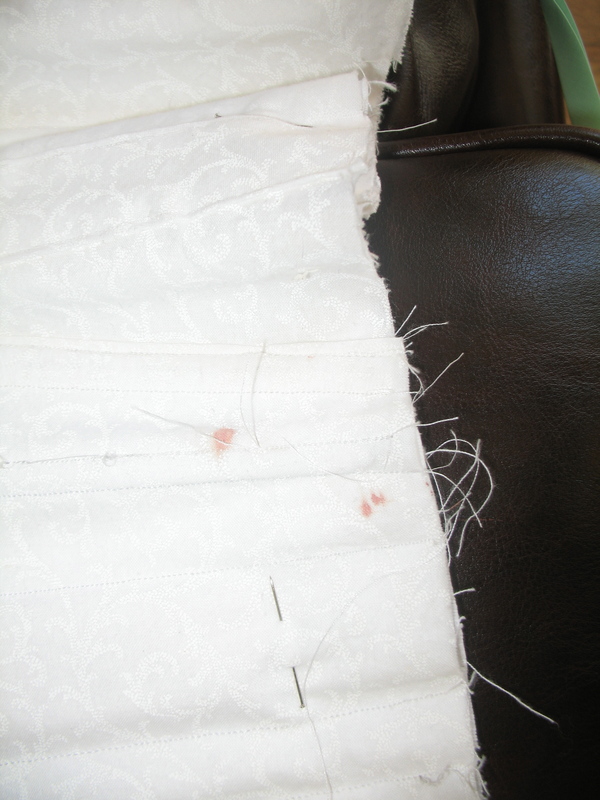 And I faced my fears and made the buttonholes on the coat (by hand) and the gown (by machine). I hate making buttonholes. Mine never come out looking tidy and decorative; they are just barely functional. I have said elsewhere that I don’t like finish-sewing: hemming, cleaning up seams, sewing on trim and making buttonholes. I like the big architectural aspect of sewing (in the same way that I like putting together Ikea furniture: you take many pieces and turn them into something else). But there’s no point in spending money on fabric and notions and then leaving the seams to fray and the bottom to straggle and the buttons to go unbuttoned. 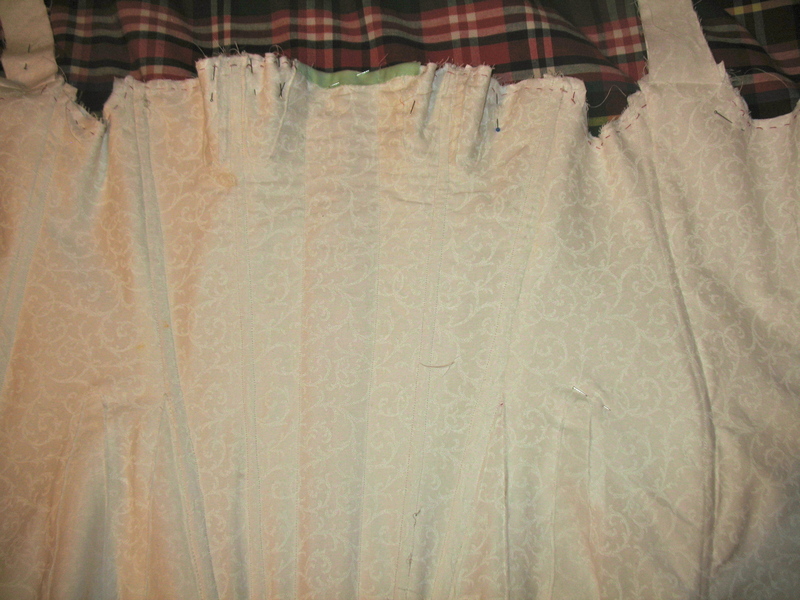 So I screwed my courage and my patience to the sticking point and hemmed and lined and stitched and, yes, buttonholed. All the seams on the skirt were French-seamed too (really, you don’t want shreds of thread getting caught in your stockings when you’re trying to look ladylike and put together. 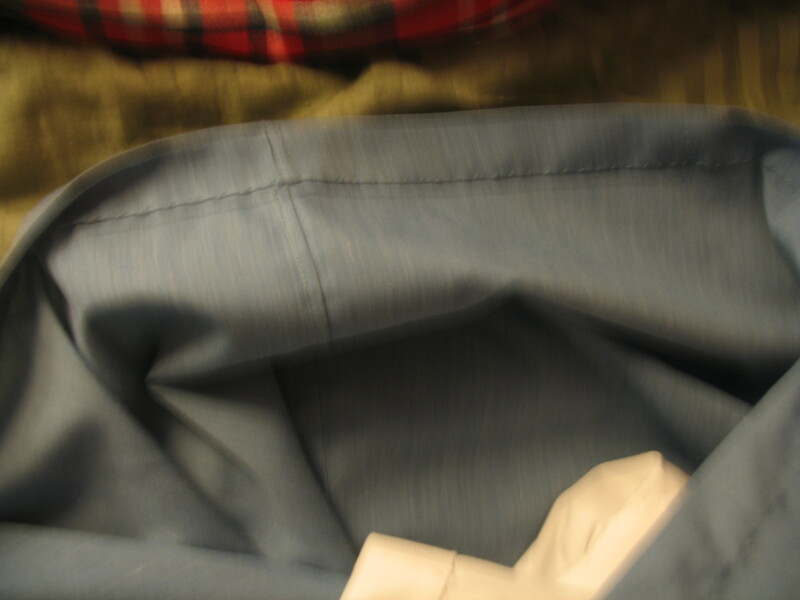 Then hemming; another hand-sewing job. 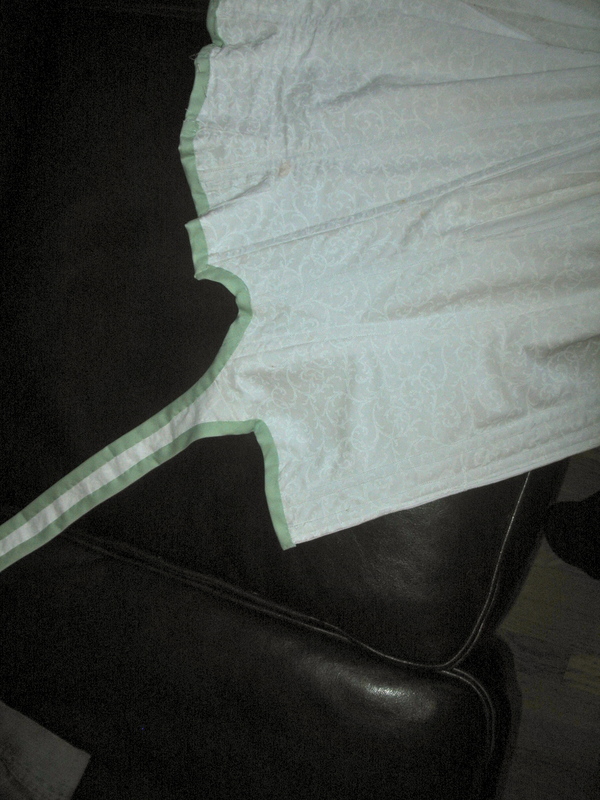 Since the skirt was lined, this meant two hems. You want your hemstitching to be as invisible as possible, but you also want it to be strong enough to withstand, say, an inadvertent foot catching therein. Finally, the buttonholes. 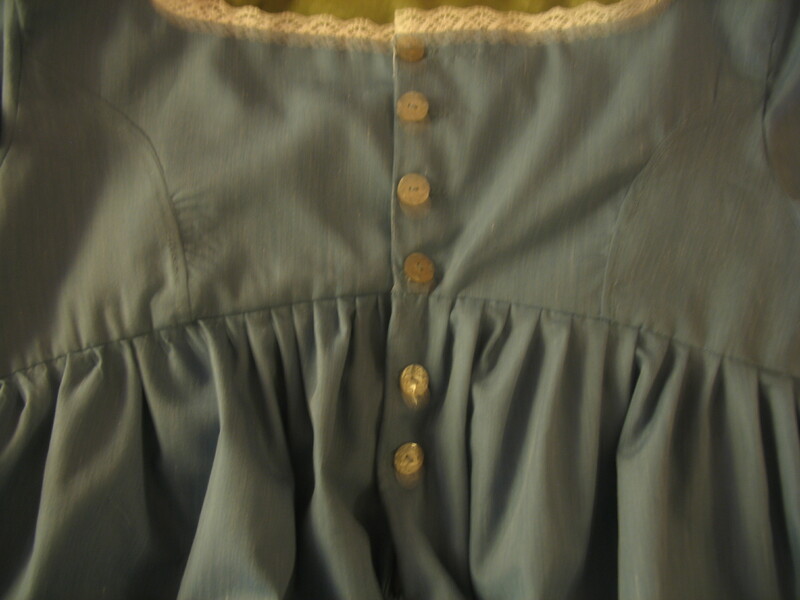 I am no way pleased with the machined buttonholes on the dress, but with the buttons in place they don’t look too terrible. I hope. Sadly, with the buttons unbuttoned, the result was less pleasing. With machine-sewn buttonholes I did the sewing first, and cut the hole afterward. As for the coat: there were so many layers of fabric in the coat, I didn’t want to do machined buttonholes. So I did them the old fashioned way, by hand. 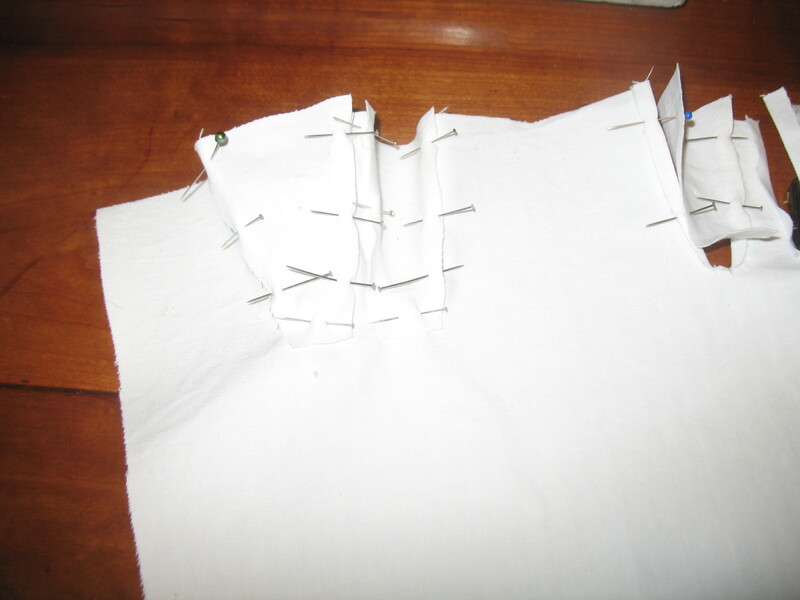 With hand-sewn buttonholes, you cut the hole first and then bind the hole with stitching. Finally: this time I did not make a blood sacrifice to the project, which was a happy thing. On the other hand, a pin gave its all for the cause. So glad it was the pin that got bent out of shape and not my finger. 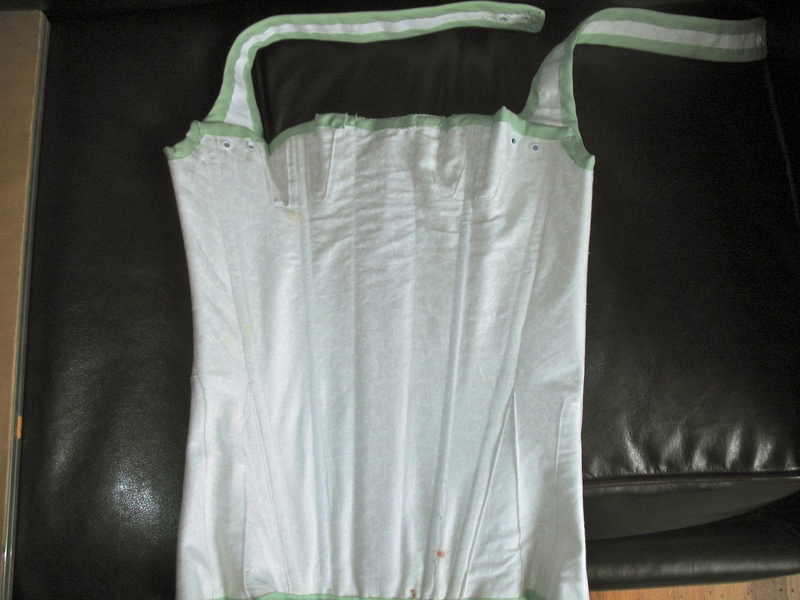 The curious thing about this Regency sewing project? I’m already thinking about the next project. Drunk with power after the relative success of my corset-making expedition last week, I dived right in to making the Regency coat that I need for my photo shoot. 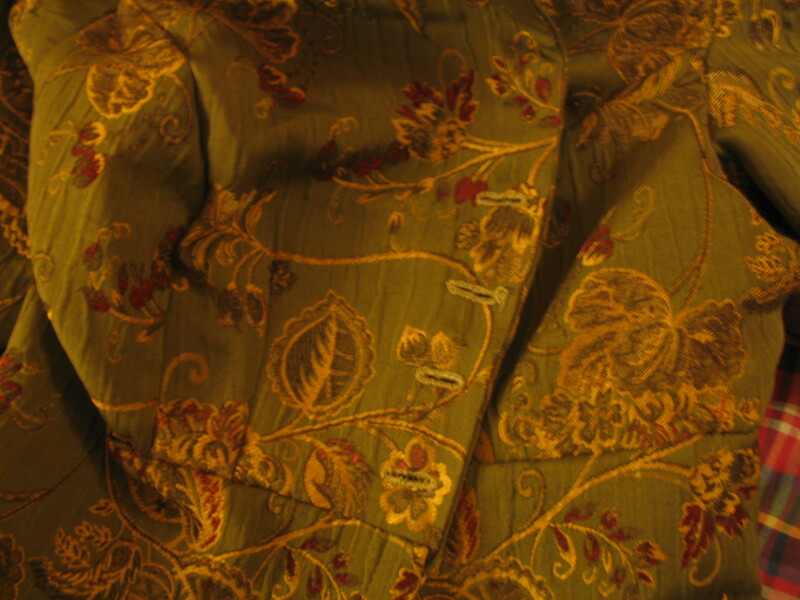 As I said previously, a few weeks ago I found this fabric–actually, six curtains (about 50″ x 90″ each), in an olive green brocade, and at once determined that I must make a coat of them. Actually, steel. 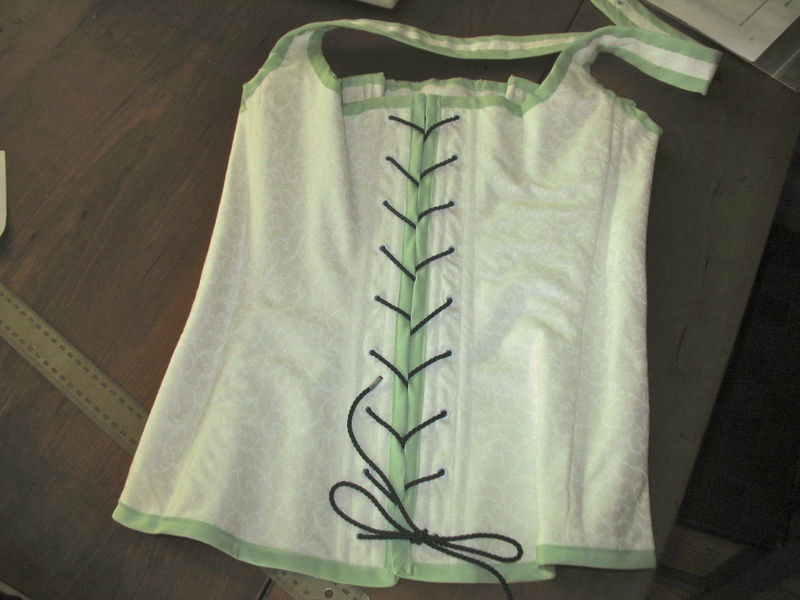 Be that as it may: the corset is done! 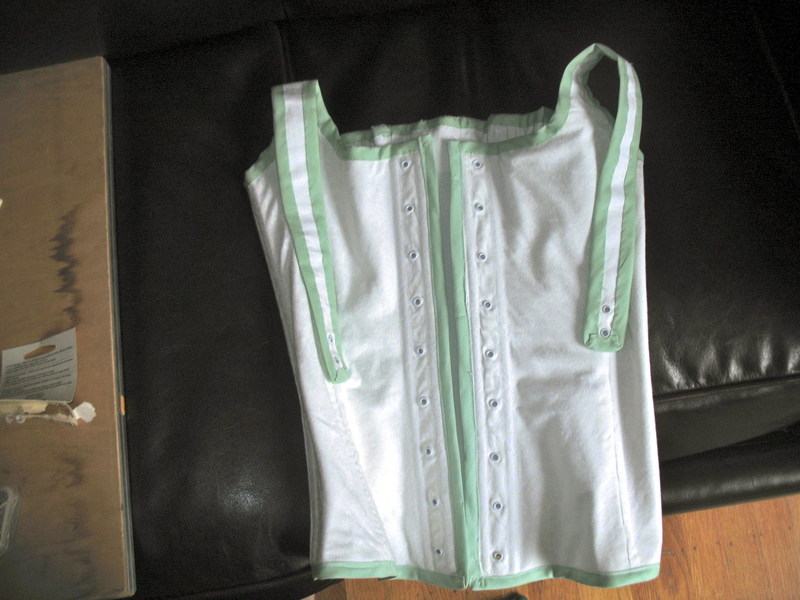 I suspect that it will be an audition for doing it again, now that I know how it goes (I found an error in the directions–or at least an omission, and contacted the pattern maker, who very obligingly gave me the answer I needed, and promised to go fix the directions at once for the next hapless corsetière. 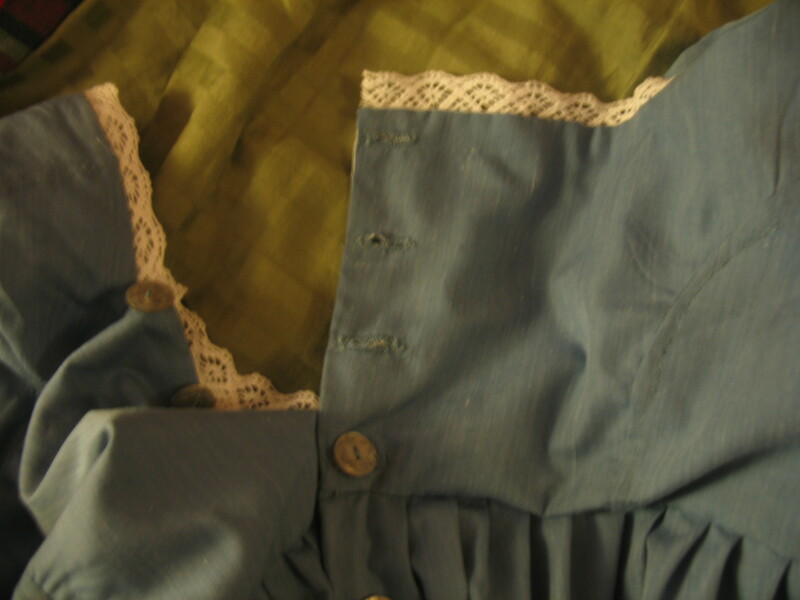 When we left our hapless home-seamstress, all the gussets had been made and all the layers pinned together. Now comes the fun part. 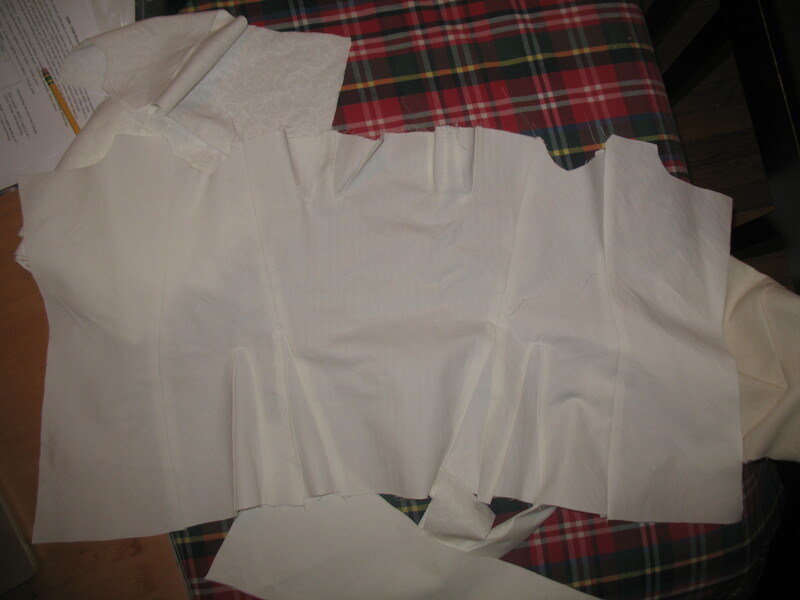 First I basted the top so that everything lined up, and tacked all the gussets and seamlines together–you really don’t want continental drift in the underlayers of your underlayer, as it were. Everything basted and tacked, I made a pocket for the busk to go into. What’s a busk? A flat piece of bone, wood, or latterly steel. The modern ones are often jointed in the middle for flexibility, but the whole point of the busk here is to render things less flexible and more constrained. My busk was about 14″ long, and slightly wider at the top than at the bottom, so I had to top stitch the layers to make a pocket, and then edge the top in two layers so there was a finished edge to the pocket (the bottom edge will be closed in binding, later. 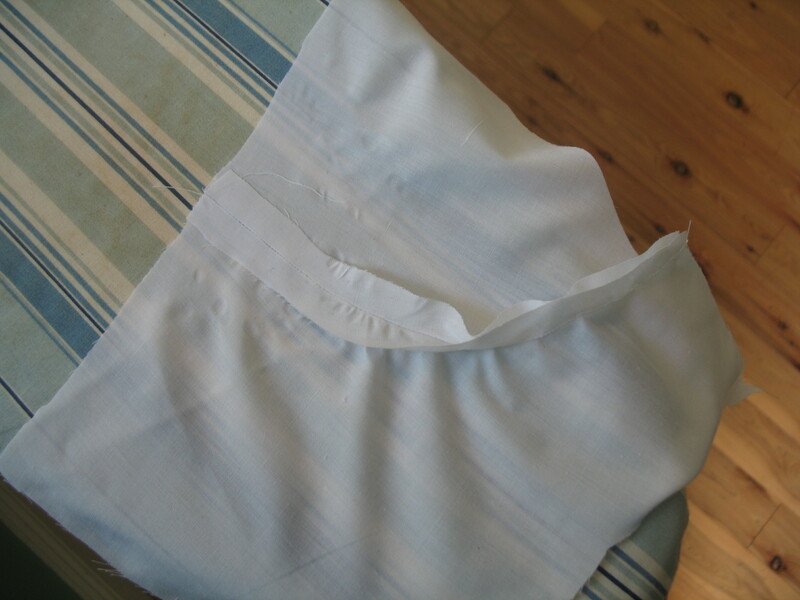 You can see that I also sewed the channels for the stays. 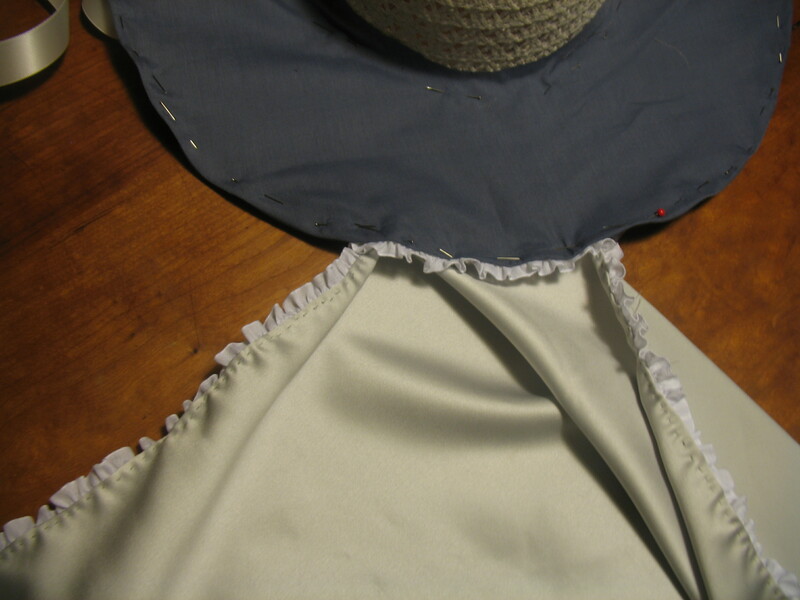 As noted: steel stays (which came in around Miss Tolerance’s time, give or take), 1/4″ wide: two pairs for the back, and one at each seam, plus a set between the bust grommets and one that rides up the side from one hip gusset to just under the arm. With only one exception, I managed to make all the channels just about the right width: snug but not so snug I had to have an argument with my fabric. Once all the stays were in place, I started binding the edges. This is tedious. It’s also the process during which I did something I haven’t done in years: stabbed myself so badly with a pin that I actually bled on my fabric. So I have made my blood sacrifice to the Gods of Sewing, and have the blotch to prove it. Once all the edges were bound, it was time to put in the eyelets. 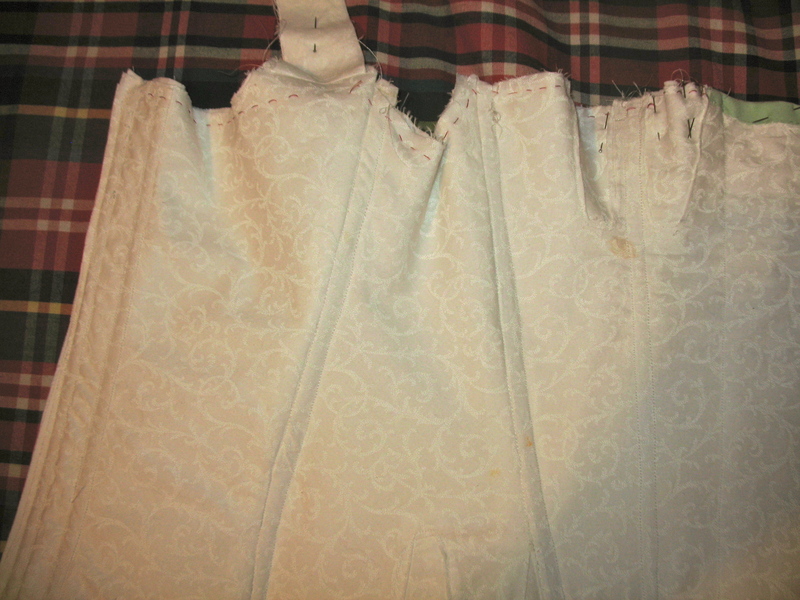 Next time I do this (if there really is a next time) I may want to use larger-bore eyelets, but these were what I had. 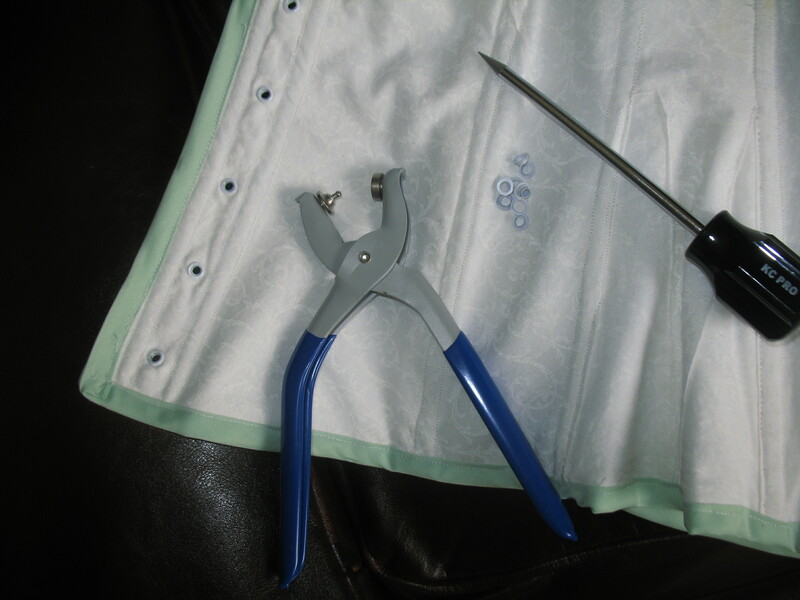 Basically, you poke a hole in your fabric using an awl, then fit one side of the grommet through the hole and use the tool to crush the other side of the grommet onto the first side. It takes a little hand strength and patience. Actually, this whole project requires more patience than fabric. And here it is, all grommetted! But without me in it. Because infrastructure should remain, err, infra. Dig? Yes, it’s all true: I am in mid-corset. Because I have to make a Regency coat, and it won’t look right without the infrastructure (modern underpinnings will not cut it). To my considerable surprise, the whole process is much simpler than I had imagined: with a decent pattern, up to the point I’ve reached now, it’s really a matter of tracing the patterns (I’ve been using baker’s parchment) and cutting out the pieces and following the bits and pieces. 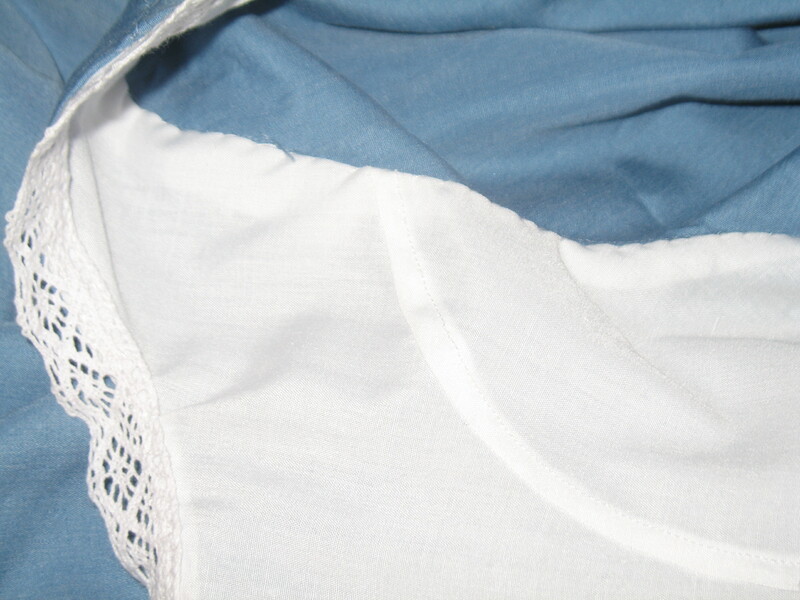 My gusset-anxiety has proved to be an over-reaction; gussets are no harder than anything else. So here’s how it’s been coming together. It’s amazing how real it all looks with the stitches in and everything. I am surprised by this every time I sew. Here’s a closer look at the gussets because I’m so pleased with them. The fabric, by the way, is coutil, which is a very closely-woven fabric with a herringbone patter, and the preferred material for the interior of corsets. 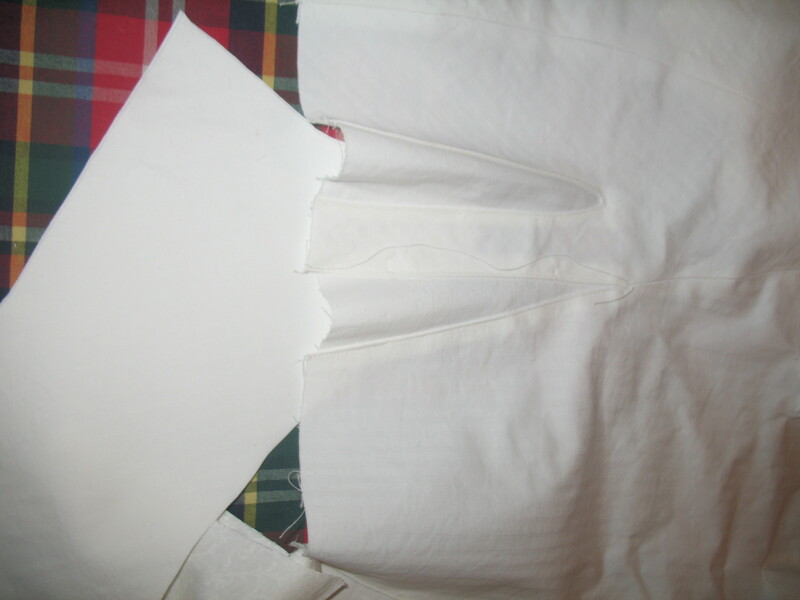 And here are the gussets, all pinned, for the lining. 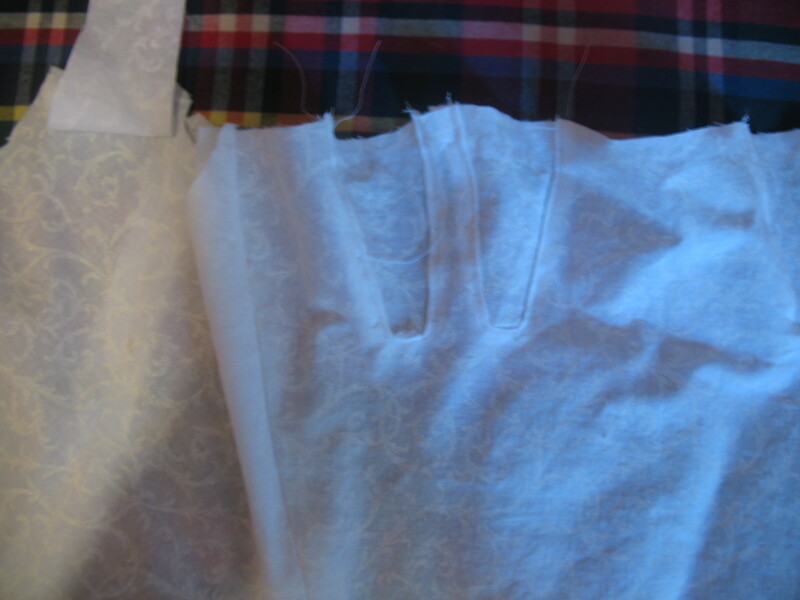 And here are the lining and interlining, all in form and pinned together, awaiting only the exterior layer. And here’s the cover, in a plain figured cotton. I decided against satin or anything ritzy: I want this to breathe. I also decided against cherry red or deep blue (although white, as the color of choice for corsetting, didn’t become popular until the Victorians) because I plan to wear a light-colored dress over it. Which I will have to make. But that’s another post. I still have to stitch the hip gussets and the strap seam. 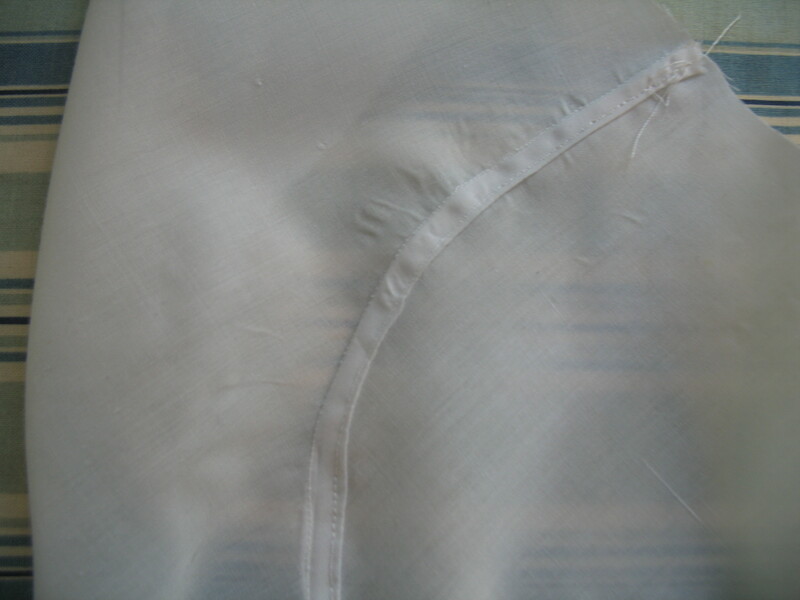 Then the whole gets pinned to the already-pinned lining/interlining, and basted together. And then the really cool/scary part begins: the boning. The thing that looks like a ruler is a busk: a flat piece that will run up the front between the breasts. The rest are stays of varying lengths. By the time you read this, I may already have begun that part. I will review my progress next week. Sometimes the synchronicity is just so…synchronous, you know? I wasn’t looking for fabric when I went out today. After the farmer’s market this morning (strawberries! ripe tomatoes! peaches sweeter than my daughters!) I went to a garage sale a friend was having, and for $30 picked up six lengths of green brocade-y sort of fabric–not period, but close enough to play period on TV, as it were. I had no idea what I would do with this fabric, but it was beautiful, and sometimes things come up (viz: my younger daughter coming home last month to announce that I was costuming, not just her, but three classmates, for a scene from Romeo and Juliet) and you need fabric in a hurry. Let me parenthetically explain that I am a self-taught seamstress; I love the construction aspect of the whole thing, making a garment come together, the architecture. I have no patience for the finishing bits, and it’s only because I can hem, or whipstitch, or do whatever it is while watching TV, that things I sew don’t look like a bad pile up on I-280 at rush hour. So I don’t often take on anything much more complex than a costume for my kids. 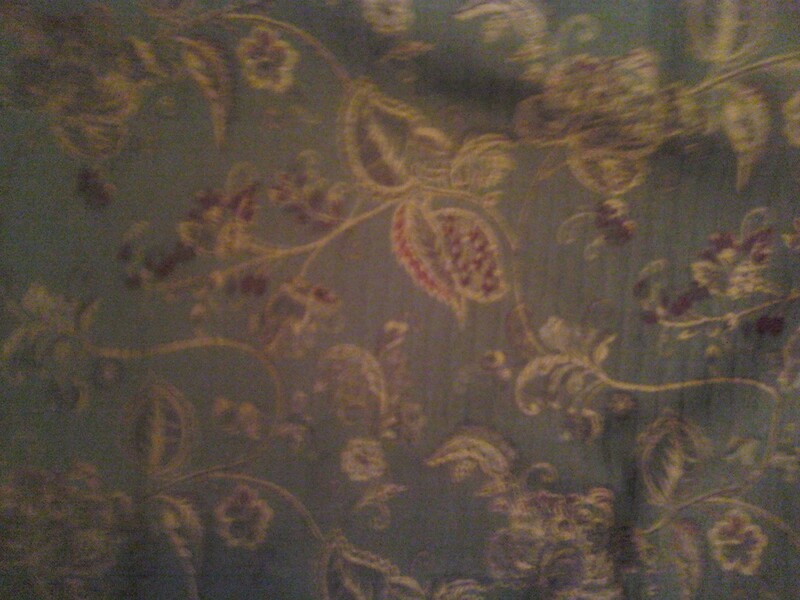 And I have this fabric, see, that would make a perfectly splendid coat over a muslin round gown. It would not be perfectly period; coats were generally made of plain-colored fabric; patterned fabrics generally had very small patterns that were woven in. But…oh, it would be a handsome thing. I’m thinking a coat using the spencer pattern shown here: but with an ankle length skirt, worn over a dress like the one below, only in a light muslin (the silk is utterly gorgeous, but 1) not my color and 2) too expensive). 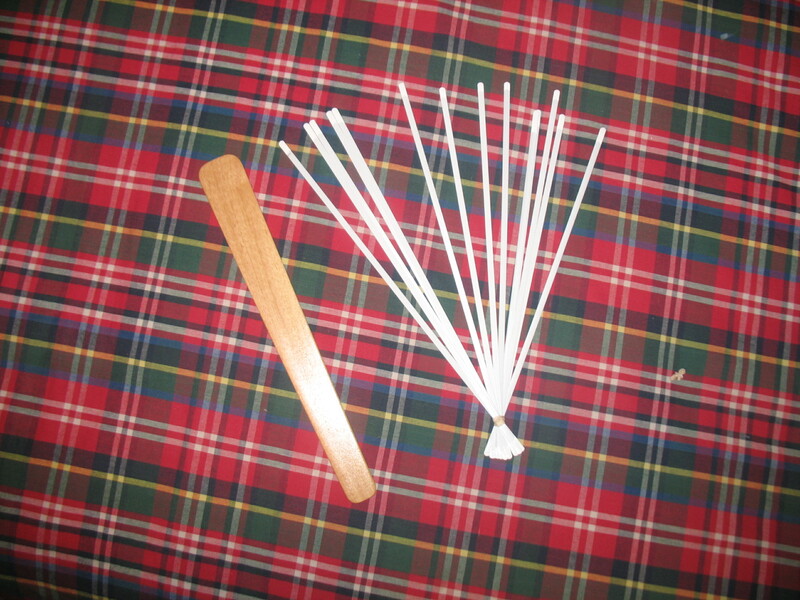 The problem is, even before I began fretting over the spencer and gown, I’d have to make myself a set of stays. Stay-making is a big production, particularly because I can’t just wear any old stays any more: they’d have to be highly structured. In fact, I got the pattern for stays this afternoon and spent an hour reading them: I’ll tell you, that sweet ingenuous muslin-gown look had a hell of a lot of infrastructure. And really, do I need a project like this? And yet I have this fabric that so wants to be made into something splendid. But now that the thought has occurred to me, it’s really hard to stuff back into the bottle. If you don’t hear from me for a while, look under the sewing machine.